The new ValueJet 405GT- Coming Soon!! Customize your world with personalized t-shirts, hats, workout apparel and more. The new ValueJet 405GT - Coming Soon! Customize your world with personalized t-shirts, hats, workout apparel and more. No screens to burn or messy inks to deal with. 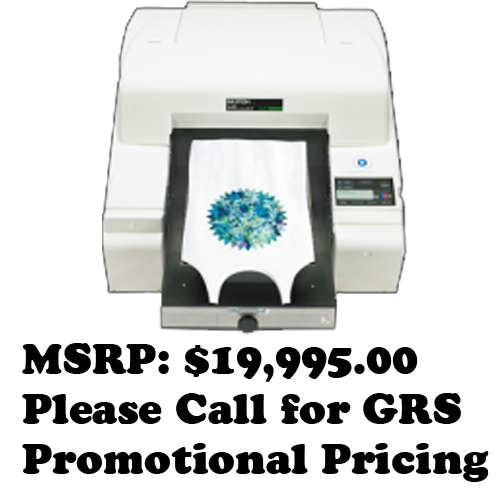 Print custom designs and photographic art work directly onto your t-shirts with vibrant CMYK ink for incredible on white shirts and use white ink for printing on black and colored t-shirts. Its small footprint, large easy to use 7" digital control panel, expanded print area and fast print speeds are only a few of the features that make the ValueJet 405GT a valuable addition to any print or screen shop. Fast, simple, affordable and easy to operate.